Getting to try new things is something that excites me a lot as a blogger. There are very few occasions when I resist myself using a product our of inherent apprehensions... because till date most of the products that I have tested and tried on myself come from natural/ ayurvedic/ organic/ mineral range from elite brands. 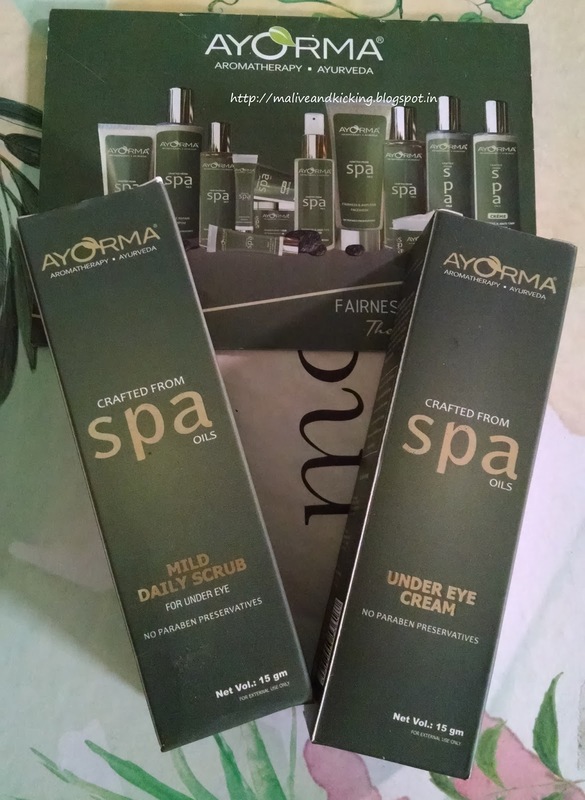 In past few days, I had introduced a premium brand Ayorma on my blog that is a heavenly union of Aromatherapy and Ayurveda to guarantee you a Spa-like experience at home. 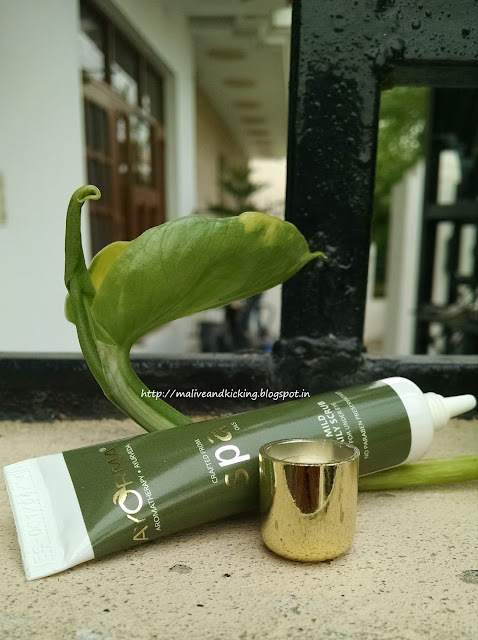 I had already reviewed its anti-tan facewash for attaining beautiful facial skin. But there is something on our face which makes it more expressive i.e. our eyes. Besides taking all the good care of our face with religious CTM routine, we need to give equal importance to our eyes too. 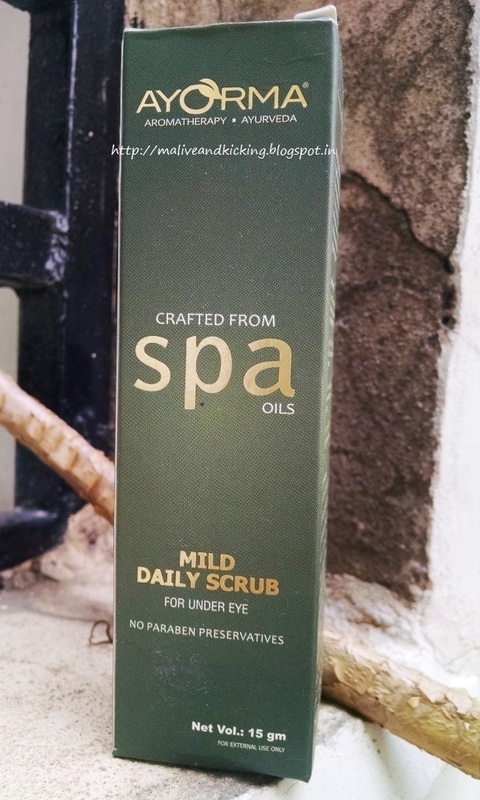 A mild daily scrub for the eyes that gently exfoliates dead skin cells and impurities around the delicate eye area and diminishes the look of dark circles, shadows and fine lines giving it a luminous glow. Licorice & Turmeric: : It helps remove darkness or tanning under the eyes and reduces melanin production. It has the property of imparting natural glow and radiance. French Lavender Oil is obtained through distillation from flower spikes of certain species of Lavender. This oil is known to soothe itchy skin because of its anti fungal properties. 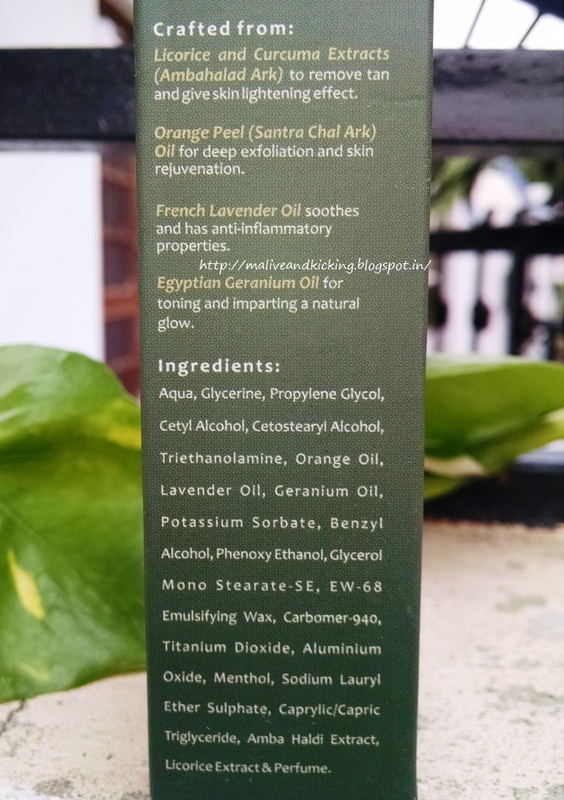 Orange Peel oil, a well known anti oxidant and anti aging ingredient. 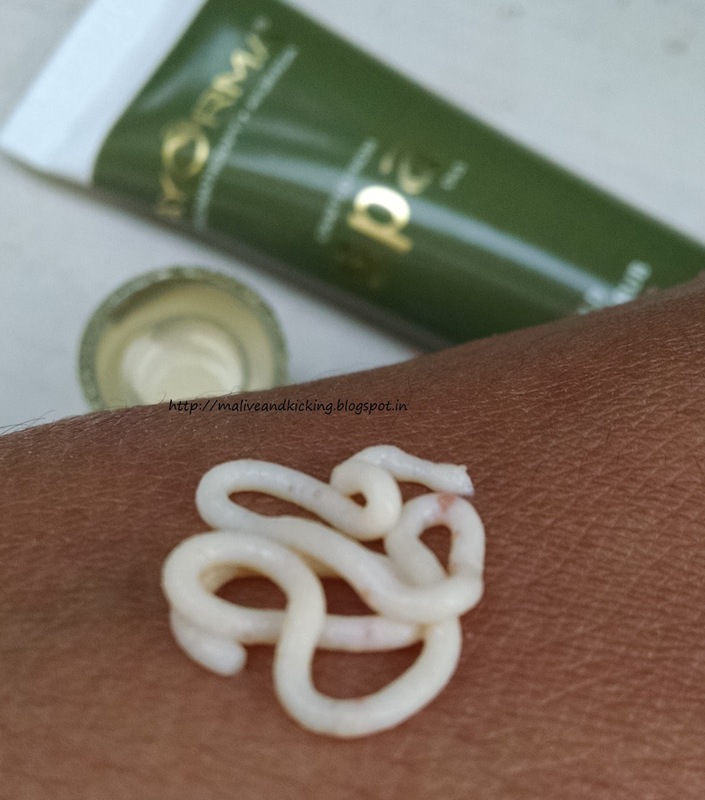 It helps the skin to look firmer and smoother by deep exfoliation. Geranium oil for toning of skin. A moisturizing eye cream that works instantly and overtime to diminish the look of dark circles, shadows and fine lines. 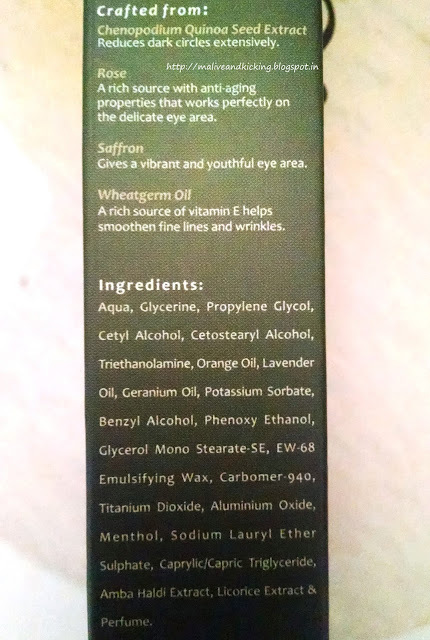 The luxurious SPA oils hydrate and calm the eye area. Saffron: one of the most expensive spices is said to reduce dark circles extensively. Saffron also protects the eyes from the direct effects of bright light. Wheatgerm oil is a rich source of Vitamin E & Vitamin B. It has anti aging and anti oxidant properties. which helps repair tissue damage and promotes tissue growth. Quinoa: It is exceptionally high in proteins resulting in a good balance of essential amino acids that detoxify and diminish puffiness of eyes. Rose: It treats tired and fatigued eyes and adds a natural sparkle to your eyes. 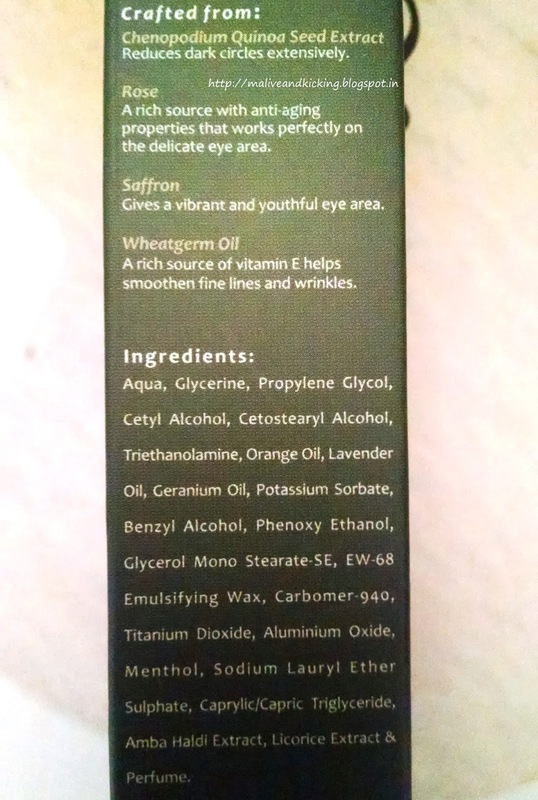 The under eye scrub is a formulation made out of mild exfoliant orange peel. The scrub is in lightest shade of brown n offwhite. It has minute exfoliants in red color that you can see after a closer look at the pic below. The scrub gives a cooling sensation on application under eyes. It just relaxes your fatigued eyes and doesn't cause inflammation or watery eyes. I like to have it massaged in gentle strokes as it removes all the impurities to impart smiling eyes instantly. Using the scrub is also helpful in cleaning residue of eye makeup. The exfoliant granules may look far scattered and less in number, but they very much feel on skin. Moreover, I think having them more in number will lose the purpose because the skin under our eyes in much more delicate than other body parts. Not to forget a mention of delightful fragrance in the scrub which may seem somewhat stronger to sensitive people, but I liked it. 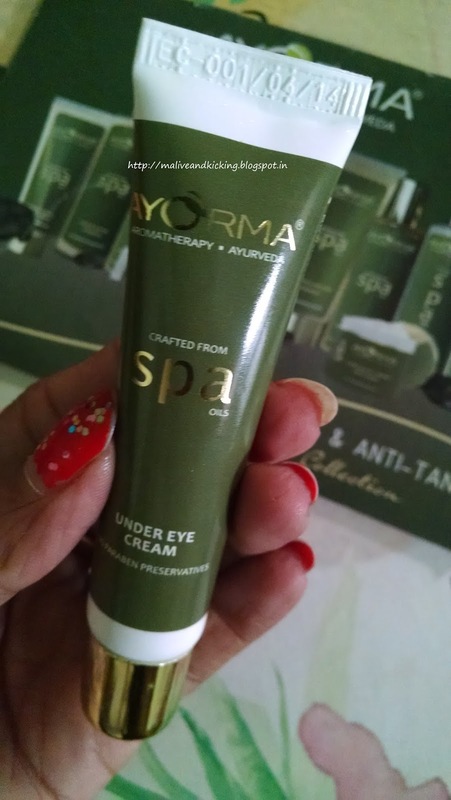 Post scrubbing, I take a break of few minutes and then apply little quantity of Ayorma Under Eye Cream. 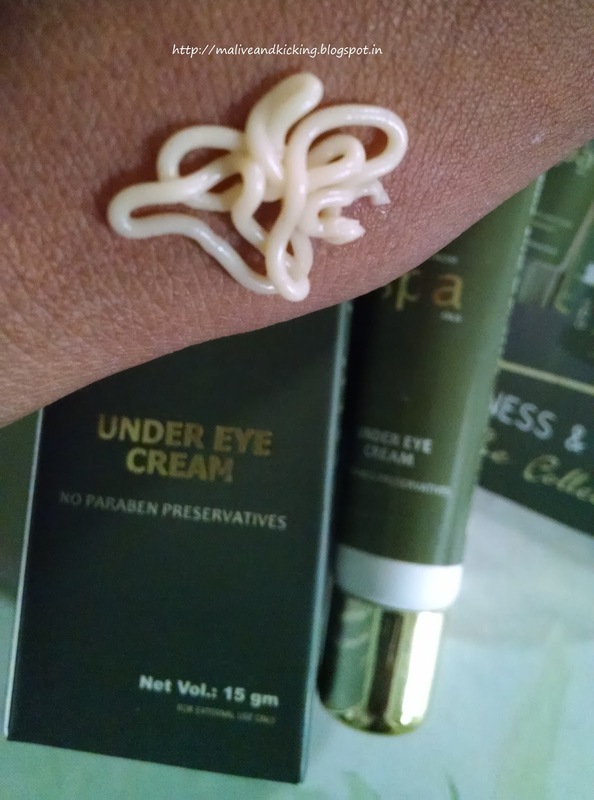 The under eye cream is similar to the scrub is color and consistency, but I didn't like its medicinal smell much, but its not intolerable. Since I apply this cream after scrubbing, it gets easier for the cream to penetrate into the skin. The most common issue of puffy eyes can be kept at bay if you strictly go by this routine. This cooling scrub and cream combo certainly does go some way to reduce the appearance of fine lines around the eye area and reduces the intensity of dark circles. These hero products from Ayorma, when used in perfect combination help smoothen your complexion of eyes' skin, resulting in a good help to keep your eye make-up in place as well. I can vouch for excellent ingredients like saffron, rose, quinoa etc. used in the infusion of eye cream that are destined to give good results. The best thing about these products is that they are paraben and preservative free. There are many luxurious Spa oils to keep the eyes hydrated and relaxed. They come in a thin nozzled light-weight tube. The product can be directly applied on skin, making the packaging more convenient and hygienic. You may include either of the products in your eye care regimen and may skip using both at one time. But it is advised to follow the complete steps to avail expected outcome. These products can be used daily. Never heard of an eye scrub. I have to try this out. Mine is also first time with eye scrub and it feels good. It is quite gentle Ankita. There was no skin irritation while rubbing or post rinsing. A new kind of product. I will look out for this. Under eye scrub is something new to me! I would not use the scrub for undereye area! Great review!